Baking And Boys! 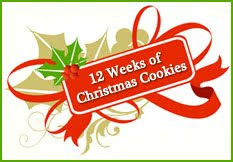 : Twelve Weeks of Christmas Cookies—Three For One Week! Twelve Weeks of Christmas Cookies—Three For One Week! This week for Twelve Weeks of Christmas Cookies (week 7), I give you not one, not two, but three more cookies. I’m just nice that way. You’re welcome. I’ve been playing around this week with making smaller-sized mini cookies. They are fun. I love that you end up with so many more cookies by making them so small. The first cookies I made were some Mini Chocolate Chip Cookies I’d seen a few weeks back that Maria at Two Peas and Their Pod made. They looked like a great chocolate chip cookie and I just can’t resist mini treats. We’re having some friends over next week and I think it will be fun to put out lots of little mini foods. Well, beat me up, I just looked through my photos and realized I didn’t photograph any of the mini chocolate chip cookies. Go see them over at Maria’s. Mine looked just like hers. I realize now why I didn’t take any pictures. I only baked off a dozen of the cookies and froze the rest of the dough in ready-to-bake minis. I’ll have to take a few pictures when I bake off the rest next week. Great cookie, Maria, thanks! So the second cookie I made this week were some Chocolate Gingersnap Cookies that I’d found last year over at Baking Bites. I loved these when I made them last year and posted about them. I followed Nicole’s recipe except that I didn’t have any crystallized ginger, so I omitted that and added a little extra ground ginger. I also just baked off one baking sheet of these in mini-size and have frozen the rest into mini size balls ready to bake. Make these if you like ginger cookies-they are so good with chocolate! And lastly (just for this week! ), I made some mini Andes Crème de Menthe Cookies in mini-size as well. Love these. They are perfect. This is also the recipe that is found on the back of the Andes mint baking pieces bag. I followed it exactly. These are kind of like Lays Potato Chips, “no one can eat just one”. I also froze probably another three dozen of these. I think mini cookies are perfect for your Christmas cookie trays. Wrap them in separate packaging, to keep the mint flavor/smell from getting in to all the rest of your goodies. I’m silly that way. I actually also think ginger/spice type cookies should be individually wrapped. Just my little humble opinion. Okay, I’m done. There you have it—three for one. Enjoy! And look at all those other links below. It’s coming, don’t say we didn’t warn you. ;) Happy Holiday Baking! Oh my the chocolate gingersnaps look wonderful. I'm certain I could resist a having a handful of the mint cookies either. ;) I hear the bag of mint and chocolate chips calling to me from the cupboard. Must make cookies! 3 cookies in 1 week! Love it! All of your cookies sound amazing! I need to get baking more cookies :-) Your post inspired me! I'm impressed - your cookie dough actually made it to the freezer? That's more than I can say. You ARE a cookie baking machine. They'll make a lovely tray for the holidays. I love all your mini cookies. I am leaving my baking for the last minute this year. It seems when I bake ahead and put stuff in the freezer it disappears, without a trace. You are so sweet to bring us 3 cookies this week. I like that idea! Then you can eat more cookies! Right? Um...so both of these look GREAT! I will definitely be making the Andes cookies. YES!!! You've really been busy baking up a storm. Those chocolate gingersnaps look especially good. i think the chocolate ginger snaps sound great - an interesting combination. I have just finished making a mountain of chocolate balls, so think it will be a while before i get the chocolate out again, but when i do i may try this one. I want those Andy's cookies! MMMMMM. You have had a busy week! I love how perfect your cookies look. Chocolate and ginger is such an amazing combination. When I go to Whole Foods or Cost Plus every now and then they sell this chocolate bar - the brand is Chocolove. Anyway it's dark chocolate with crystallized ginger inside - and geez it's so good. I keep breaking off little squares and popping them into my mouth. It's just a little different way with chocolate and if you haven't tried 'em before you absolutely gotta give that flavor combination a whirl. OH my goodness, your hours will be Christmas cookie heaven in another month and a half... what with all of those wonderful treasures stowed in the freezer. Oh wow, they both look so tasty - I think I'd try the chocolate ginger ones first though! Yum! I love all those delicious cookies.